In 1983, at the request of their fans, Ferrante & Teicher returned to the studios to record these twin-piano solos. These workhorse performances remained the axis of their solo concert appearances. Many of the selections contained herein were first popularized on record with their orchestra. The genius of this piano-pair is attested to as they incorporate the sounds of 50 studio musicians into specially adapted twin-piano arrangements. From these new recordings and enduring concert favorites Art& Lou hit upon the simplest of formulas to delight their audience and insure their continued concert box-office success. Like gifted mining engineers, F & T tapped the richest musical veins to produce the finest and most pure extract. And it is from these rich and durable efforts the The Ferrante & Teicher Collection is offered. The magnificent “West Side Story Overture” catapulted their aptly named album to Top 10 in 1961 – remaining on the charts for one year. The “Overture” quickly became an audience favorite. From this “Overture” F & T extracted “Tonight,” to become their third million-selling single in 1961. The “Theme from The Apartment” & “Exodus” need no introduction! They have endured for nearly 40 years as two of the Top instrumental recordings of all-time. These first two back to back million-sellers would gain Ferrante & Teicher international fame and millions of new fans in 1960-61. Lou Teicher explains, “We thought ‘Exodus’ was TOO classical at the time – but fortunately for us Don Costa prevailed upon us to record it!” Their famed “Theme Team” treatments of “Love Story,” “Chariots of Fire,” “Memory” from Cats and the lovely Stephen Sondheim classic “Send In The Clowns” proved to be annual concert-hall favorites. When asked to arrange and perform “Ol’ Man River” by the producers of the Bell Telephone Hour’s 1964 “Salute to Jerome Kern,” Art & Lou had no idea that it would become a nightly backstage request. “Our fans really remembered that TV performance,” says Ferrante. “We had been performing the works of Alexander Borodin long before it was adapted as kismet. We merged his beautiful melodies and Polevetsian dances to create ‘Highlights from Borodin’ – we’ve been playing it for 35 years,” explains Lou Teicher. Their rendition of Ravel’s “Bolero” quickly became a concert favorite in the early ‘50’s. F & T devised a special “mute” – used on the repeated G note to simulate a drum effect. This unusual sound was the forerunner of their now-famous “Prepared Piano” recordings. “African Echoes,” an F & T original composition, was first introduced with these full effects in 1955. So popular with their concert audience – it was included in every Ferrante & Teicher concert through 1988! The team delivers to us “Oye Negra” a Ferrante & Teicher personal Latin favorite and an audience request for nearly four decades. And, Ernesto Lecouna’s “Malagueña” is so much an F & T personal favorite, they have arranged and performed four different versions! For this album they have included their thrilling nonstop “triple-time” recording. Ferrante & Teicher’s hands have painted a moving rhythmic picture of our times. You asked for it… by popular demand we present Ferrante & Teicher – at their best. 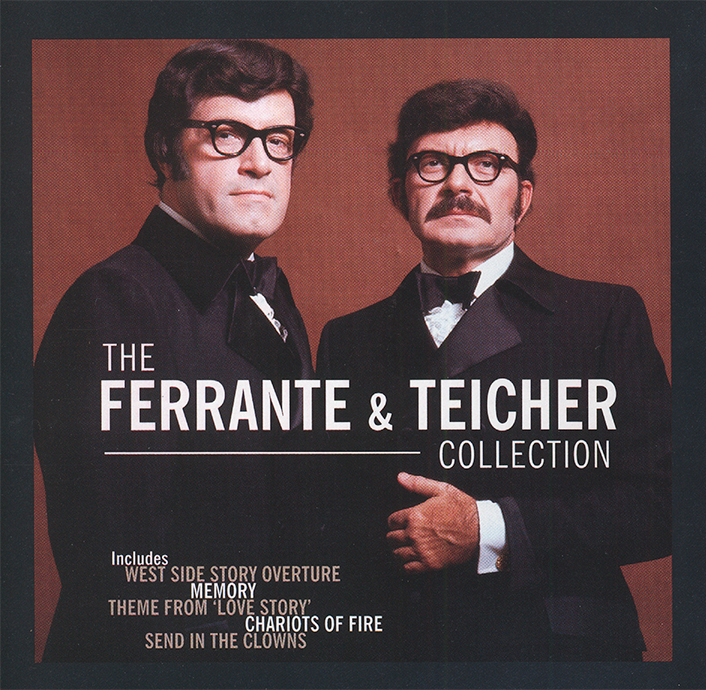 If you have seen Ferrante & Teicher in concert we sincerely hope this recording evokes fond memories of a thrilling evening. For those listening for the first time, prepare yourselves for some of the most exciting and fiery twin-piano performances of all-time. Hear now the Grand Twins of the Twin Grands – Ferrante & Teicher!